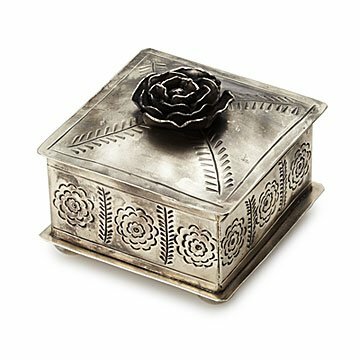 Give your treasures a beautiful home in this German silver box handcrafted in the highlands of Mexico. You may have a stunning collection of jewelry you've built over the years. Or maybe it's a mix of Punk phase safety pins and dried Prom rose buds. Whatever your collection of treasures, give it a handcrafted, velvet-lined home with this German silver box. Designed by Jason Lenox and made by one family in the highlands of Mexico, its sculpted and incised rose patterns are all tooled by hand, so each is a one-of-a-kind creation. The artisans add a vintage silver finish that gives this piece the feel of an instant heirloom. Designed in Dallas, Texas. Handmade in Mexico. Jason Lenox got his start in 2010, being inspired by early century Navajo silversmith works. All Jason's pieces are handmade by one family in a village in the Mexican Central Highlands. Traveling often to Mexico, Jason and the artisan family work together to develop new and interesting pieces for the line. Polish gently with a dry soft cloth. A great small jewelry box. Beautiful design.